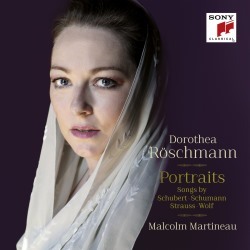 For this her debut recital CD German soprano Dorothea Röschmann’s has selected a programme with every track a portrayal of women in lieder. Röschmann writes that she was inspired by visits to the National Portrait Gallery whilst studying in London where she was surrounded by portraits of women prominent in British history such as Mary Queen of Scots. Röschmann tackles four Austro-German composers, Schubert, Schumann, Richard Strauss and Wolf with works that span over a hundred years through the development of the lied. There may be more immediately appealing soprano voices but few that grow so resolutely on the listener and make such a lasting impact. Compellingly secure and durable Röschmann soars to her top notes with ease whilst remaining in total control. Her voice is not especially brightly lit and this selection of songs frequently leans on what is a slightly dark hued quality. She is crystal clear when it comes to diction and text interpretation. Mightily impressive throughout is pianist Malcolm Martineau. He makes a royally complementary partner with a wide range of colours at his beck and call. Especially well sung is the opening song Schubert’s Heiß mich nicht reden (Do not bid me speak), D.877/2 a Goethe setting with Röschmann convincingly portraying the insecurities of the forlorn Mignon. Another Goethe setting from Schubert is Mignon: Kennst du das Land (Do you know the land), D.321 with the soprano capturing the musing of the vulnerable Mignon who longs to return home. Unforgettable is Röschmann’s atmospheric and affecting rendition of Strauss’s Morgen! (Tomorrow!) to John Henry Mackay’s text, one of Lieder's glories. Her voice is tender and soft as feather-down with Martineau’s plaintive piano accompaniment suggesting weeping. Wolf’s Goethe setting Mignon II: Nur wer die Sehnsucht kennt (Only he who knows longing) is poignantly memorable and demonstrates Röschmann’s full grasp of Mignon’s psychological torment. The sound quality is first class, natural and skilfully balanced. On track 14 you can even hear chirping birds at 3:14. It is good to see that full German texts with English translations are provided. This is a most satisfying lieder recital from Sony with suitably inspired performers of high integrity.